It's March, which mean it's still a little colder than you want it to be. Which means eventually you'll ask yourself why in the hell is it still cold. Which will lead to yourself questioning why does it have to be cold at all? And then you'll see this converted silo in Cedar Falls, Iowa and the cold, winter, slushy snow, all of it will make complete sense. The world gets cold so that people can create an epic ice climbing wall. The converted silo ice climbing wall is on Rusty Leymaster's farm right outside Cedar Falls. 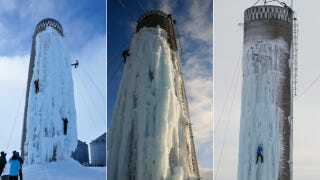 The ice climbing is a tradition that started way back in 2001 when a Northern Iowa professor hosed the old grain silo to create the sheets of ice. Not only is it beautiful (like the white wall on Game of Thrones) but hundreds of climbers come during the winter to try their hand at scaling the 8-story beast.